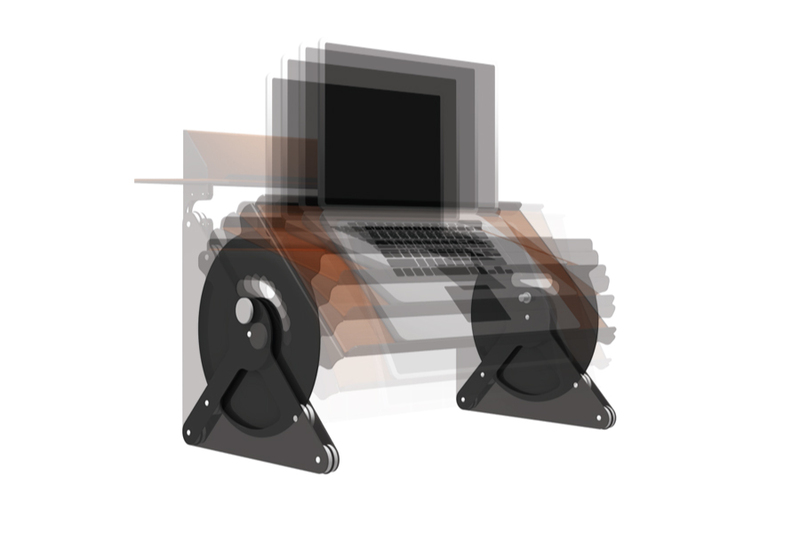 The Task Tray™ is a highly adaptable and portable workstation that allows any work materials or devices to ergonomically transition with your body throughout any standing, sitting, reclining, recumbent or horizontal posture. Like the award winning Chotto™ ( chair + ottoman ), the Task Tray™ is designed to enhance productivity by providing a variety of ergonomically desirable positions that prioritize each user’s physical and mental wellbeing. The Task Tray™ excels as a portable workstation by granting anyone the freedom to determine where, when and most importantly, how they want to work. The innovative proportions, portability and on-demand adjustability of the Task Tray™ allow any materials or devices to transition with the body through a wide range of ergonomically desirable positions that can reduce tension throughout the body and enhance both circulation and productivity. Whether you prefer to sit, stand, recline into a neutral body posture, or lay flat on you back with your knees up, the Task Tray™ can be quickly transported and adjusted on-demand by activating the two side-mounted quick-release and auto-locking mechanisms. In addition, the Task Tray™ can optimize any workspace by providing an elevated and articulated display surface for work materials or devices that you wish to reference only periodically. As an elevated display, it increases the available work surface of any desktop upon which it is placed. To eliminate the footprint of the Task Tray™ entirely, an optional wall-mounted docking station allows the Task Tray™ to be hung securely on an any number of vertical surfaces throughout the home or office. 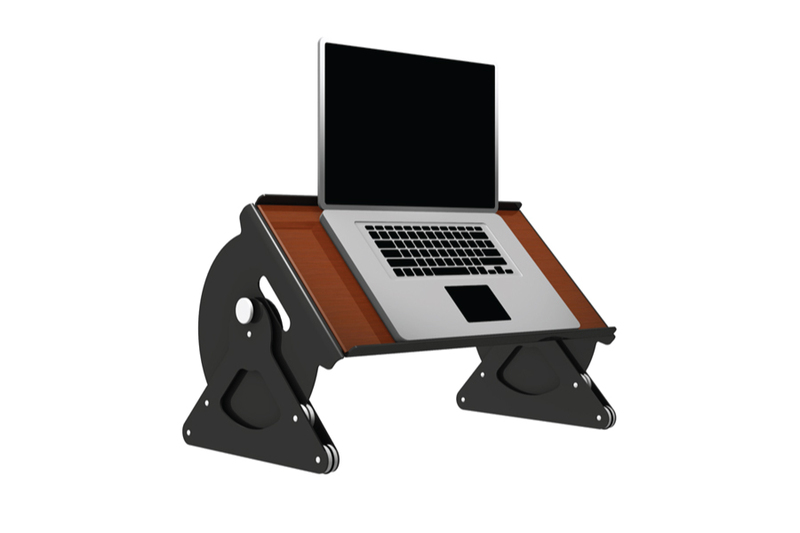 There, it can be docked as a display surface, a task surface, a standup desk or shelf. Future enhancements will also include the integration of USB ports and a power strip to provide both a docking and recharging station for multiple devices. The Task Tray™ provides the peace of mind in knowing that your productivity isn’t tied to sitting upright in front of a fixed computer display and that you now have the option to transition comfortably, at any time, into any number of ergonomically desirable postures. With the Task Tray™, you no longer have to sit for hours in "ergonomic" chairs that prioritize fixed displays over your physical and mental wellbeing. You can avoid all of the unwanted vertebral compression, muscle fatigue and poor circulation that office furniture manufacturers continue to describe as ergonomic. Finally, there is a standup desk that you can take off-road, park anywhere and perhaps, most importantly, a standup desk that lets you recline. We believe the time has come to prioritize people over products and embrace an evolutionary approach to ergonomics that, in this case, represents an exceptional example of our Form x Function™ philosophy. Dimensions : H 13" x W 16" x L 26"